This guest post comes from Rebecca Burditt, a graduate student in Visual and Cultural Studies and winner of the Susan B. Anthony Teaching Fellowship for Fall 2011. In honor of the first day of the spring semester (welcome back, folks!) she shares her experience teaching the course. Graduate students and teaching fellows, take note. Last semester, I had the pleasure of teaching Women’s Studies 100. 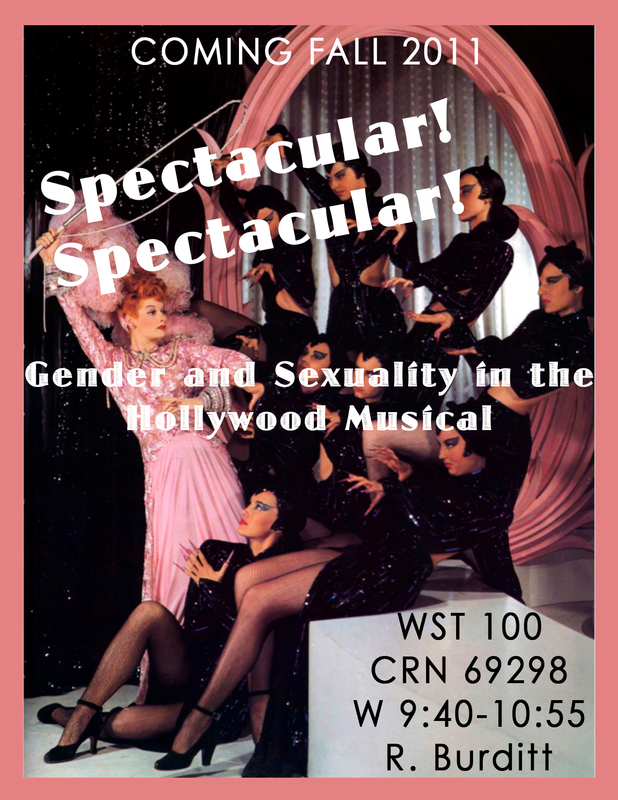 Titled “Spectacular, Spectacular!,” my course used the Hollywood musical and its related forms (such as television shows, music videos, and musical commercials) in order to introduce some key issues in gender studies. It’s always been a fantasy of mine to teach a course on musicals – to be able to devote entire class sessions to discussing, say, the implications of Julie Andrews’s gender-bending “Jazz Hot” number in Victor/Victoria, or the feminist/antifeminist valences of Madonna’s “Material Girl” music video. The Hollywood musical’s legacy of stylistic excess and longstanding associations with a camp sensibility provide a useful visual basis for engaging with concepts such as objectification and “the gaze,” queer theory, and gender parody. SBAI’s interdisciplinary focus gave me the opportunity to use musicals as objects of analysis in the classroom. Now that I’ve completed my semester, I can say that this has been a most rewarding and enlightening experience, and that I hope to have the opportunity to teach a similar course in the future. Teaching any course is not without its challenges, however, and for this class, I was particularly concerned with film selection: which musicals would best relate to the theory and critiques raised by the readings? Would students like the films? What would happen if they didn’t? In retrospect, I can say that all of this fretting was for nothing, not only because the students themselves were open minded and invested, but because as the semester progressed, I realized that their personal like or dislike of the film did not affect their ability to talk about it productively. In fact, some of the best discussions we had in class were of material that students admitted to not “liking.” Such an experience was a useful reminder that an object’s strength as a teaching device is not necessarily related to its appeal as entertainment. This eventually became an important part of the course: encouraging students to see popular culture as operating on a number of different levels, and to understand how the musical – in addition providing amusement for a mass audience – also has the potential to speak in complex ways about the social and cultural dynamics of the period in which it was made. In the end, whether iconic or obscure, whether liked or loathed, the films provided a concrete, visual starting point from which we could begin to tease apart abstract and often conceptually difficult ideas. Using the moving (and singing and dancing) image to examine foundational theories opened up many unexpected avenues for discussion. This class has even prompted me to rethink my approach to some of the films. For instance, students’ questions and comments challenged the neat, progressive trajectory that my syllabus – arranged chronologically – reinforced (as they pointed out, Moulin Rouge may not present the same kaleidoscopic lines of scantily clad chorines as Gold Diggers of 1933, and yet it still celebrates similar forms of objectification). Such discussions have given me new ideas on how to present these films and their relationship to their own history. Teaching WST 100 has taught me many things about syllabus preparation and the nature of pedagogy across different disciplines. But in many ways, it has also changed the way that I watch musicals: every time I settle in for a new episode of Glee, for instance, I think about how the class might talk about it. In addition to making even the most problematic or mundane musical texts newly interesting (the remake of Footloose, the musical episode of Grey’s Anatomy, etc. ), it has also pushed me to see issues of representation, iconicity, and genre in a new light. Among many other things, I’m grateful to SBAI and my students for this, which will continue to shape both my teaching and my scholarship in the future. This entry was posted in Guest Blogger and tagged @interdisciplinary, #film, #guestblogger, #SBAI, #SBAIgrads, #teaching. Bookmark the permalink.